Sea Colony West - amenities galore! 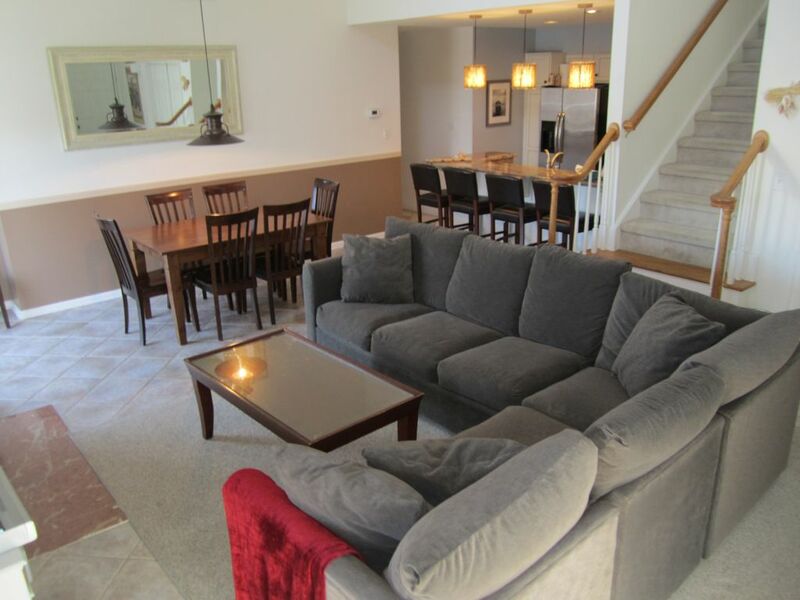 Your "home away from home" at Bethany Beach! This upstairs end-unit condo is just lovely. Three bedrooms and a sleeping loft will house 2-3 families nicely. Three full bathrooms, too! All decor and newly-renovated kitchen are meticulously maintained. After a day at the beach or pool it is so nice to come back to a clean, comfy place! Take advantage of our close proximity to the beach (under 1 mile); walk or bike to town for dinner or take the free shuttle (every 15 minutes, within 100 yards of your front door!). There are miles of wonderful walking trails in Sea Colony, 12 pools (2 indoor) and 22 indoor, clay and hard-surface tennis courts. Our brand-new athletic complex was completed in 2016! There are activities galore all week long in the summer months, and some hidden gems in the off season. Bethany is a wonderful family town that is close to Ocean City and Rehoboth boardwalks, but quiet and safe for those times you just want to chill out. Our 'Gold' rated unit is perfectly located in a quiet part of the development at the end of a cul-de-sac, yet close enough to all that Sea Colony has to offer. Linens, towels, cribs and just about anything else you may need can be easily rented through a local company. *Please note this is a SUNDAY-SUNDAY rental in the Summer. We are a family of four who fell in love with Bethany Beach years ago. If you've been here, we know you love it, too. If not - come check it out! We maintain everything on a regular basis because it's our home! Also - we are not a large rental company so we are very responsive to any questions or concerns - we take your feedback seriously! We have a team of helpers to address any situation that may arise. We spend a LOT of time here, so can offer all kinds of advice about fun things to do in the area. Master has separate Jacuzzi tub and shower. Other two bathrooms have tub/shower combo. Full kitchen renovation in late 2013. Dining table seats 6-8 and counter seats an additional 3. Television in the main living area, master bedroom and in the 2nd bedroom. We have a ton of books - feel free to take one and leave one! Some games for kids and adults for your use. You can easily rent at several locations around town. Bike racks are abundant in Sea Colony and downtown. Over 20 outdoor and indoor courts. Lessons and clinics available (for a fee). TWELVE indoor and outdoor pools! Many within walking distance! This beautiful unit has soaring vaulted ceilings and a lot of natural light. Contemporary decor, yet very cozy. Sea Colony boasts twelve indoor and outdoor pools, free beach shuttle (but you can also walk or bike there! ), kids activities, and a quaint little town for dinner out or just an ice cream! Beautiful home! Thank you for sharing it! The only suggestions I might have are some more basic kitchen items and maybe improved mattresses. Our family enjoyed our week at this beautiful and spacious townhouse. Our family of 5 enjoyed a lovely week in this home. The amenities were very nice, very clean, and comfortable. It was a very spacious 4 bedroom in Sea Colony, and the tram to and from the beach was very easy and picked us up right in our parking lot. Excellent, clean house, comfortable, really felt like a home away from.home, wonderful.stay. sea colony is great for families, lifeguards are outstanding, There is extra.cost 40 per person for badges to.use sea colony but totally worth it. Our family enjoyed staying at this condo. There was plenty of room for our family of 6 adults and 3 children. The condo was very well maintained and we would recommend to other families. The location gave us access to all of the Sea Colony Resort beaches, pools, playgrounds, trams, etc. Thank you for creating a great environment for our family vacation. 32 Indoor and outdoor tennis courts and 12 pools!